Are you a graduate student and new to teaching? The CTL offers programs and services throughout the academic year to help graduate student instructors build confidence in their teaching and engage with a community of peers; practice a variety of techniques to facilitate learning within their teaching context; develop conceptual frameworks for their teaching; and discover a diverse array of resources to develop their teaching and support students in their classroom. Orientation for graduate students occurs before the fall term and will prepare you to teach with concrete approaches to set expectations for your students, frameworks to prepare lessons, and resources to support your growth throughout the term. Learn more. In the Essentials of Teaching and Learning series you will take a deeper dive into frameworks and tools new instructors can use to facilitate student learning. Topics include leading an interactive section, grading problem sets and written assignments, and inclusive teaching. Learn more. In Teachers’ Lounge, graduate students and CTL staff informally converse over pizza about teaching approaches, drawing from research and one another’s classroom experiences. Previous topics included grading and assessments, inclusive teaching, and international perspectives. Learn more. A series of informal lunchtime conversations similar to Teachers’ Lounge designed specifically for graduate student instructors of foreign languages. Share teaching approaches and experiences with peers while engaging with research from the field of Second Language Acquisition. Learn more. Lead Teaching Fellows (LTFs) are experienced graduate student instructors who develop departmental workshops specific to the teaching and learning needs of their departments and can help support you and your peers in your teaching. Check the LTF wiki (log-in with UNI) to see upcoming LTF events. The Center for the Integration of Research, Teaching and Learning (CIRTL) is a consortium of universities who share resources to support the development of future faculty in STEM and Social Sciences. Check out the CIRTL website for online resources, courses, and workshops that can further your development as a STEM instructor. Visit our CIRTL at Columbia page to learn more about on-campus opportunities or check the CTL Events Calendar for upcoming events. Microteaching practice sessions provide a venue for you and other instructors to practice your teaching with a small group of peers. Try out new tools and approaches, and receive immediate feedback from peers and a trained facilitator. Learn more. The CTL offers Mid-Course Reviews (MCRs) with trained peer consultants who can help solicit feedback from your students on what they find to be the most helpful and the most challenging aspects of your course. CTL Mid-Course Reviews are confidential, formative, and designed to support you in your teaching practices. Learn more. Teaching observations give you an opportunity to receive confidential feedback on your classroom instruction by a trained peer consultant. As you start out teaching at Columbia, sign up to be observed leading your lab or section. Learn more. The CTL meets with graduate students seeking consultation at all points in their graduate teaching career. This includes consultations on teaching statements, professional development, preparing for the job market, and general teaching-related support on a first-come, first-served basis. Learn more. 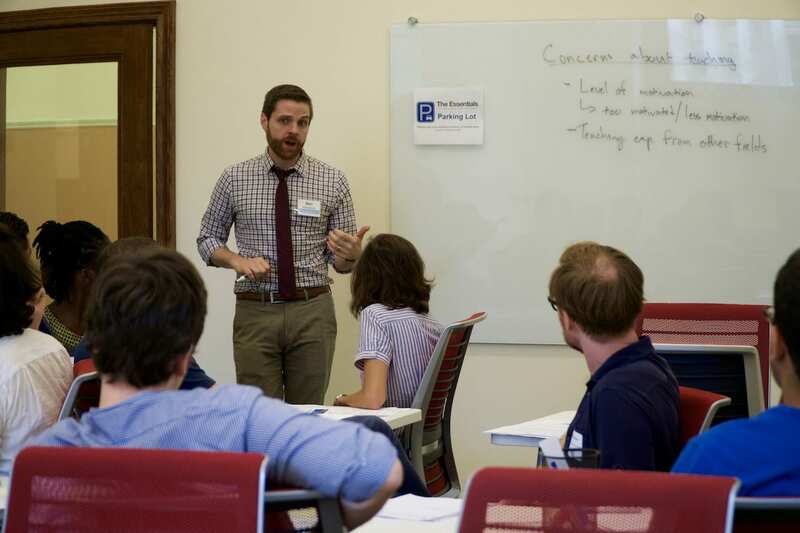 ITSI is a four-day immersive experience in June during which participants develop an innovative assignment with an interdisciplinary cohort of graduate student instructors. Learn more. Learn more about Advancing Your Teaching in the Humanities and Social Sciences and Advancing Your Teaching in Sciences and Engineering.